I know that there is no "ideal" grind for making espresso (or rather, like most things, it depends on the machine and the tastes of the drinker), but I am looking for guidelines as to how different grinding levels effects the end product, so I know what to look/taste for. In particular, is there any clear indication that the grind is too fine? I use a Capresso conical burr grinder and a Delonghi EC155 pump espresso machine, and usually either Metropolis or Intelligentsia espresso beans (my local brands), in case this level of detail helps! Grinding coffee for espresso is probably the most difficult to get right. The coffee grind needs to be fine enough to increase the pressure required to push the water through the filter and create a good crema. But if the grind is too fine, the ground coffee can block the coffee filter. 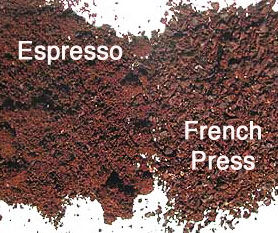 Generally, espresso coffee grind resembles a mixture of powdered sugar and fine beach sand. Since each espresso machine is a bit different, you may have to experiment to get the coffee grind just right (Allmann Bros Coffee). Brewing espresso is particularly susceptible to problems relating to an inconsistent grind. I am not familiar with a burr mill specifically, however burr mills are generally recommended for espresso grinds as they tend to provide consistency. Bear in mind that the grind can either be too coarse and the water will run through without much extraction due to the pressure and space between the grinds, or it can be too fine and allow for a backup of water and espresso water and grinds all over your counter. NOTE: The pressure with which you pack/tamp the puck (the grinds when pressed in the brewing basket form a puck) will also play an important role in the extraction process and the crema formation. You can get a feel for how hard to tamp the puck by getting a scale and pressing down until you hit about 30 pounds of pressure; you want to pack the puck at that pressure of tamp. Flavour espresso with vanilla without adding sugar or other sweetener? What makes coffee grinds sink in a french press? What difference does the bar pressure makes in espresso coffee machines? How long is the life of a shot of espresso? What features should I look for when buying an espresso maker? Is this a good way to grind beans for espresso?